Basically, from ever since I can remember in the last 11,158 days I’ve been alive (but who’s counting, right?!) My mums mum, also known as my Nana, has baked this Be-Ro Christmas cake using this recipe. So, to me, this brings back good childhood Christmas memories. Unfortunately, my Nana now is too ill to bake said cake every year which makes me sad. But she happily told me her secret recipe (not that it is a secret). So I made it, late November. I then decorated it using ready-rolled Marzipan. And made my own Fondant (sugar paste) icing and covered it in that. Unfortunately, the cake did not make it until Christmas. We, umm *shuffles foot* ate it. When I say ‘we’, I actually mean ‘mainly me’ *shuffles foot again and looks guilty*. The fella had a couple of slices and so did the kids, but I, umm, ate the rest! But all was not lost. The cake was uber delicious and tasted just amazing, just like Nanas! And I soon realised that this so-called Christmas cake was really an unexpected, unrealised practice run! I’ll be happy if my next one turns out as good or even better. Back then, when I made my own fondant (sugar paste) icing which I covered the cake in. I realised I wanted to try my hand at gum paste figures. I did have some rubber figures to fall back on in case all went horribly wrong and this time when I planned to re-bake my Christmas cake, I’m using ready-roll regal ice. But I wasn’t planning that back then as I wasn’t planning on being the weak-willed sugar monster I am. 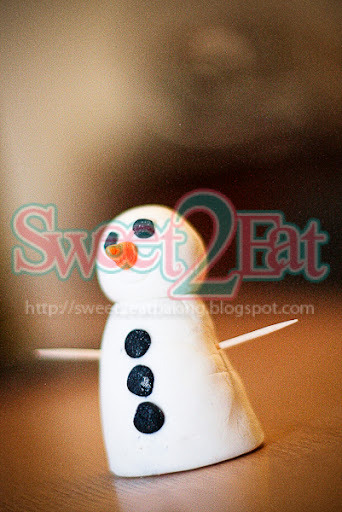 But hey-ho, I made my own gum paste snow man. He’s actually too big to go on the cake, standing at approx. 2.5-3″ tall. But I made him and he’s my first attempt. Please don’t laugh (although, inside I’m secretly cackling!) I didn’t have any gum paste tools back then so I improvised just using my hands, back of paintbrush to sink in the eyes and the buttons and of course, that beautiful, yet tacky, tooth pick… hurrah! I won’t be using Mr Ghetto Snowman from down in the Bronx this year. I’m sure the kids will devour him in a single bite, but I definitely will be trying my hand at gum paste models in the future. I think I’ll try to have the arms come together at the front, which will obviously look better than ghetto toothpicks! Heat oven to 150ºC, 300ºF, Gas Mark 2. 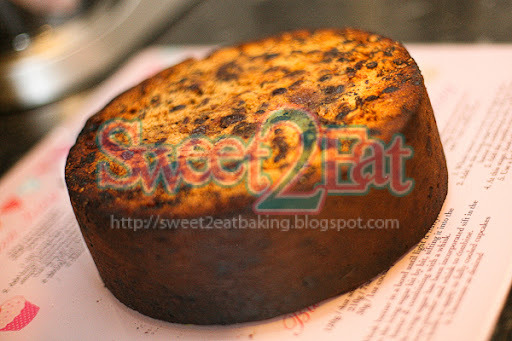 Grease and line a 23 cm (9 inch) round or 20.5 cm (8 inch) square tin. (I used a 20cm/8″ round tin on both occasions. Sieve together flour, spice and ground almonds. Beat eggs with milk. Cream butter and sugar, stir in flour mixture and egg mixture alternately, a little at a time. Lastly add fruit. Mix thoroughly. Place mixture in prepared tin and protect with brown paper. Bake for about 3½-4 hours. Allow to cool then cover with almond paste (Marzipan) and leave for 1 week. (see my alterations below*). If possible, stand the cake on a revolving cake stand or upturned cake tin. Spread the icing on with a palette knife dipped in hot water to ease smoothness of the finish – but avoid making the icing too wet. Cover the cake completely with icing, using sweeping strokes of the knife. Then spread the top smooth. To make the sides straight, bring the palette knife around the cake continuously, holding the knife upright. N.B. If the cake is to be iced further e.g. piping, leave to stand for 24 hours. I altered the way I created my cake. On the method, step 6, I did not cover the cake immediately after cooled. I fed my cake with brandy the day after cooking. I then spread the cake with warmed spreadable apricot jam (so the Marzipan stuck to the cake) when the cake had fully absorbed the brandy. I covered the cake in marzipan and then immediately after with my home-made fondant (sugar paste) icing.